SUMMARY: A group of teens and young adults battle against a corporation's attempts to take over the minds of the six top world leaders using nanotechnology and biots. WHAT I LIKED: Remember the movie Innerspace? If you haven't seen it (or maybe weren't born when it was released in 1987), Innerspace is about a man who volunteers to be reduced to a microscopic size and injected into a rabbit in order to study the rabbit's bodily systems. When nefarious evil-doers try to steal this technology, the miniature man is instead injected into the body of a socially-awkward everyman played by Martin Short. For those who have seen Innerspace, the comparisons to the movie will be evident right away. We have eyeball skating across a milky-white cornea, nanobots that basket-weave a brain aneurysm, giant and monstrous dust mites, and life-sized globs of ear wax. These parts of the book were ultra-cool and really show off Michael Grant's incredible writing talent and creativity. Though BZRK wasn't my cup of tea, there is absolutely a place for it on high school library shelves. 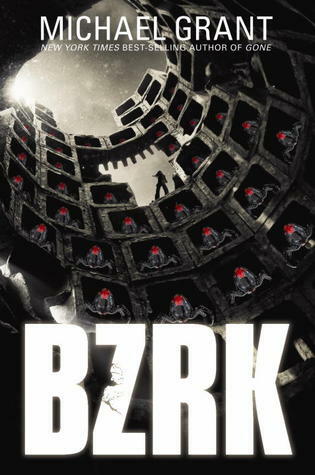 I've compared Michael Grant to Stephen King many times, and BZRK reinforces that comparison. Readers who enjoy Tom Clancey, Stephen King, and Michael Crichton will find plenty to love here. I can think of several boys at my school who would love it. WHAT I DIDN'T LIKE: The characters. Some, like Bug and his mind-controlled girlfriend Jessica, are very well-drawn. Bug reminded me of Harold in Stephen King's epic The Stand (one of my favorite books of all time). The Armstrong Twins were so lifelike I could picture their grotesqueness in every scene they were in. But other characters, like Noah and Sadie, left me feeling disconnected. I liked Noah and Sadie okay, but I didn't really know all that much about them or care what happened to them. Because of this disconnect, I just wasn't invested in the characters' lives or the danger they were in. The technology. Okay, the Innerspace-esque technology is really cool. Teen sci-fi lovers will eat it right up. But some readers (like me) will find themselves skimming the nano-talk. It wasn't really explained well, and I felt like I needed more background (or any background) in nanotechnology and biotechnology in order to really follow the story properly. There were times I had to force myself to get through those parts just so I could get back to Noah and Sadie's story. The pacing. Despite lots of action sequences, I just wasn't pumped up about it. This was no Unwind. THE BOTTOM LINE: Not my thing, but it's an excellent choice for high school boys who love action and sci-fi. STATUS IN MY LIBRARY: On order. I am in a MS/HS now, and I know this will be popular. Other: BZRK just has an adult "feel" to it. The characters are in their late-teens and early-20s.